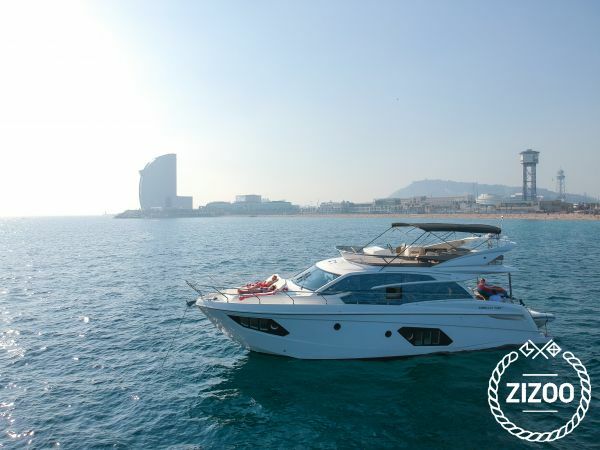 Within her 16 meter length, luxury and design merge with Barcelona Skyline and she seems to be an integral part of the surrounding environment. She counts with a friendly and expert captain, who takes care of every detail. On the upper deck you can find a bbq ready to cook fresh fish, an ice maker and a large sofa, together with a table and thanks to a couple of chairs, up to eight people can cozily spend time together. The front deck is perfect to sunbathe and enjoy Barcelonian vibes; while the back is perfect to have dinner in the comfortable table and sofa area and jump to the weather with security and style. Moreover, she counts with spacious interiors, such as a master cabin featured with double bed, sofa and en suite restroom and two additional cabin with double bed. She is filled out with luxurious amenities, such as a grill to cook fresh food at her interior, a swift dinghy and water toys. Chartering a yacht in Spain is one of the best ways to explore the beauty and diversity of one of the world's most visited destinations. With 8000 km of stunning coastline, Spain is also one of the most dynamic sailing destinations. From the golden beaches of Marbella to the vibrant coastal city of Barcelona, Spain offers the perfect mix of culture and relaxation. This boat is currently unavailable. Please send us a request so we can help you find a similar offer!